During lunch I was offered a choice… should I get my lunch at Mac Donalds or would I go for the more quisine La Place. Luckely I chose the first. 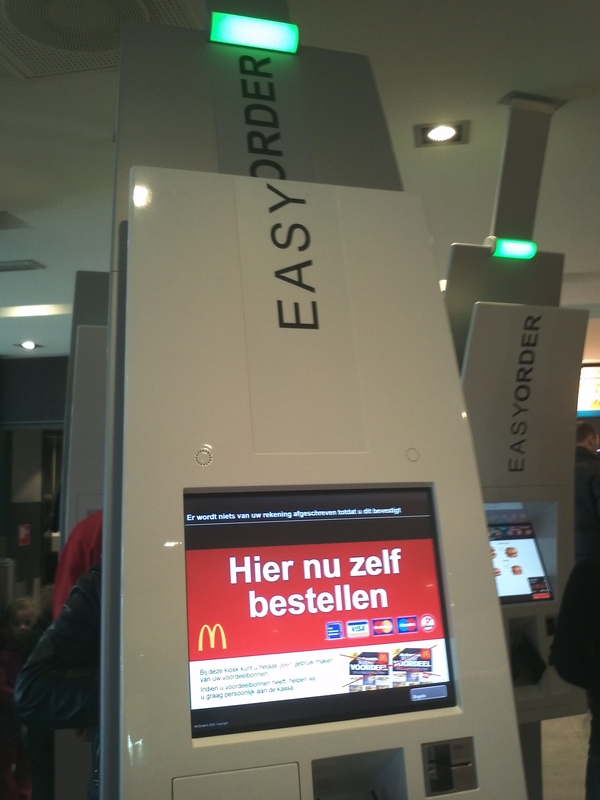 Besides just eating a couple of burgers, I was introduced to the new Easy Order system. This genius little machine makes the low waged cashier at Mac Donalds obsolte. It makes the customer the employee. A whole new experience in my book. It works like this: you go to the machine, use the touchscreen to place your order, pay, receive a number and collect your food at the counter. You don’t even have to talk to no one, nice aighhh… The only thing I wondered: Where’s my wages, I did part of the work right? I am a real fan of ecommerce, and this is where ecommerce meets real life. More of these features will arrise in near future I reckon. I can’t wait for the virtual IKEA so I never have to enter there again..